On Wednesday January 17 , MEP Peter van Dalen, together with MEP Catherine Stihler, co-hosted the launch of Open Doors’ annual report, the World Watch List. Unfortunately, this year’s report highlighted a worrying trend; persecuting against Christians is increasing. Of the 2.48 billion followers of Christ in the world today, 1 in 12 face severe to extreme persecution. 30 of the 50 countries on the list saw an increase in persecution whilst North Korea remained the worst place in the world to be a Christian. China also remained in 43rd place on the list, although the recent disturbing news reports of Church demolitions suggests a new campaign of the authorities to crack down on the Christian population. Throughout the entirety of Asia, 1 in 4 of the 393 million Christians who live there, are severely persecuted. 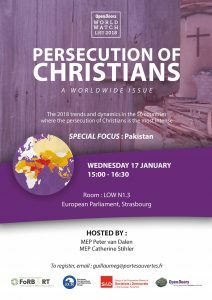 The focus of the event was Pakistan, number 5 on the Watch List, where the situation facing Christians is particularly bleak. Even though over the past year overall persecution has decreased, Pakistan was the country where the most violence against Christians was recorded.